The Doctor’s Take: The immediately softer surface offers pressure point reduction for the joints, but the less stiff base may not work for certain back pain sufferers. When it comes to firmness, the 9” high Gaia is the middle model memory foam mattress by Tempflow, a division of Selectabed. Its feel is compared to the TEMPUR-Cloud Supreme by TEMPUR-Pedic (TEMPUR-Cloud Supreme is being replaced by TEMPUR-ProAdapt Soft). Being in the middle range of firmness and feel, Gaia has had and continues to have broad customer appeal. It is this middle range – the “Goldilocks feel” – where the one-model, one-feel mattress-in-a-box start-ups made their initial huge-volume market splash in 2014, igniting the current boxable bed trend. Adding to the appeal of Gaia are the patented Airflow Transfer System and Biogreen Memory Foam (described under Key Features). As with most Tempflow mattresses, Gaia has three layers: two Comfort Layers and a Channeled Support Base. It also shares the same Kool-Flow cover with the other models. You can see how Gaia compares to the other Tempflow models on the company’s mattress recommendation chart and comparisons page. Gaia is encased in the Kool-Flow Cover. This knitted blend of 43% bamboo-derived rayon, 56.4% polyester and 0.6% Lycra brand spandex with hundreds of micro-vents is part of the Airflow Transfer System (described below). This is the outer cover, which is zippered for removing and washing. Non-toxic fire protection is provided by the fire sock liner, which has none of the chemicals which have come under fire for endangering the health safety of mattresses. The upper comfort layer of the Gaia is 2” of Tempflow’s 5-lb SD Biogreen Memory Foam. In Gaia, this is the “ultra pressure-sensitive” version of this foam, meaning that in addition to its memory it also has a quick initial response, not waiting until it first warms up. This is a feature usually associated with lower-density memory foam. According to customer reviews, the Biogreen is both soft and supportive. In Gaia, the lower comfort layer is 2” of Selectabed’s PolyFlex, which is also used in the lower comfort layers of its Memory Zone Mattresses. This polyurethane foam is less firm than the base foam of most all-foam mattresses. This layer could also be described as a transition layer, midway in firmness between the softer top foam and the extra firm base beneath. Along with the Biogreen Memory Foam above, the PolyFlex is ventilated with thousands of vertical perforations as part of the Airflow Transfer System. Primary support in the Tempflow Gaia is provided by the 5” high Channeled Support Base (CSB). In Gaia and other Tempflow models, the CSB is more than the support core for the mattress. It is a key component of the Airflow Transfer System. Air channels with a square profile are cut into the top surface for horizontal airflow. The CSB consists of extra-firm, high-resiliency polyurethane foam. This keeps the memory foam in the top layer from bottoming out. Along with the second comfort layer, it prevents the memory foam from over-flexing, prolonging its usable life. 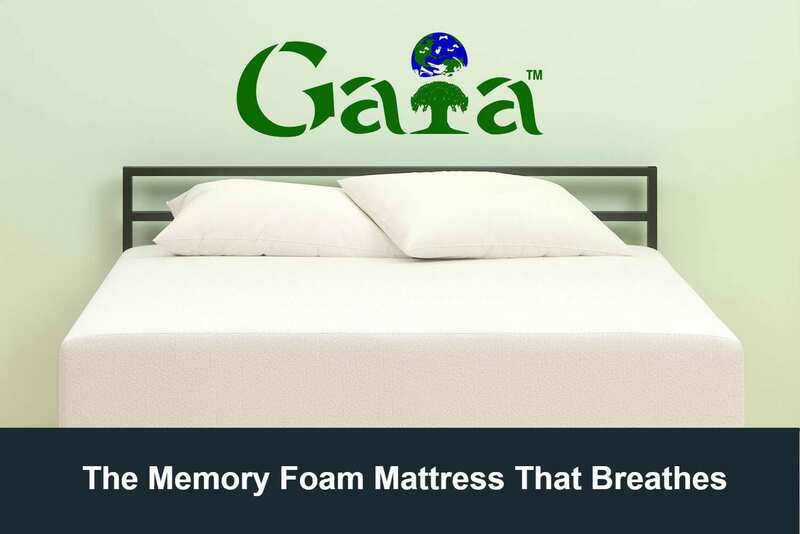 The Gaia Mattress shares two key features with all other memory foam mattresses by Tempflow – the Airflow Transfer System and Biogreen Memory Foam. 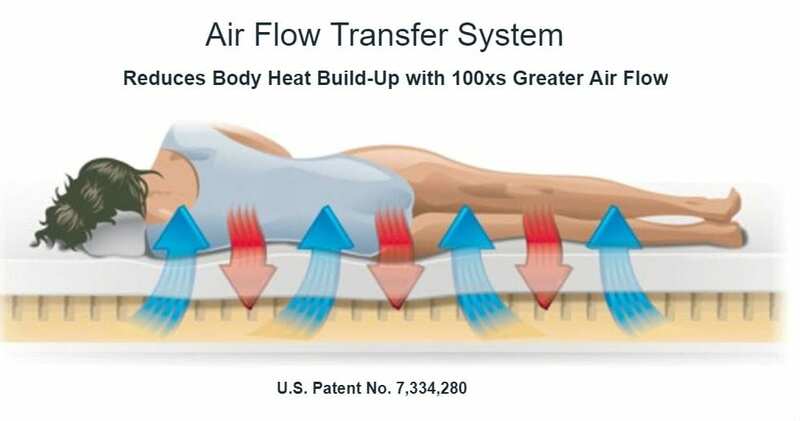 The Airflow Transfer System is a whole-mattress solution for cooling and freshness. The CSB (described above) connects with vertical pore punched through the upper layers. Air flows through the vertical ventilation and the horizontal channels to-and-from the Micro-Vents in the sides and top of the Kool-Flow cover, letting warm air escape and cool air to come in. Tests and demonstrations show that the Airflow Transfer System has many times more airflow than open-cell foam. The original Tempur Material (aka “memory foam”) was closed-cell foam, and it had no airflow. It was followed by open-cell foam, which lets air filter through, Vertical ventilation does allow for some airflow, but only back-and-forth in the same vents. Likewise, convoluted or channeled foam beneath only allows the horizontal flow of air if not connected to vertical ventilation. Putting them together lets air flow both ways, warm air out and cool air in. You can see this in the following demo and animation. Biogreen Memory Foam was introduced after the Airflow Transfer System. The composition and process for producing this foam eliminated toxic substances, such as phthalates and PBDE, and lowered volatile organic compound emissions. According to the results of testing in a UL lab, this is only ¹/₁₃ of what is allowed for certification by CertiPUR-US and ⅕ the GreenGuard Gold standard for children and schools, the strictest emissions standard. The warranty of the Tempflow Gaia is for 30 years, three times as long as that for its TEMPUR-Pedic equivalents. The sleep trial is for 120 nights, as opposed to the older firm’s 90 nights. The Tempflow page for the Gaia has a memory foam mattress comparison of this model with the TEMPUR-Cloud Supreme by TEMPUR-Pedic. Although the Gaia and the Cloud Supreme are alike in several ways, they do have a few notable differences. Both models use memory foam developed from NASA’s original cushioning material. They both are made in the U.S.A., have memory foam of more than 5-lb density, have a soft feel, and are extra supportive. The Gaia has the Airflow Transfer system for freshness and cooling, while the TEMPUR-Cloud Supreme does not (although its Breeze version does have a ventilated comfort layer). It also costs less. The closeout sale for a Twin XL TEMPUR-Cloud Supreme HD is $1,819.30, while the same size is $1,299.00 factory-direct, and Twin is available for $1,199.00. The new TEMPUR-ProAdapt Soft Twin is $2,299.00, and the Twin TEMPUR-Adapt Medium is $1,599.00. There are only nine customer reviews and ratings for the Tempflow Gaia, since it is sold on only one website, in one showroom, and through a handful of chiropractic clinics. All of them are 5-star ratings, while most mattress models online would have at least one rating of 4 or less. Gaia has received two 5-star reviews on Beds.org, one on GoodBed, and six in Tempflow testimonials, giving it a 5.00 average rating. It also has favorable mention in articles on Space Daily and LA Splash Magazine. Customers have said that the Tempflow Gaia (1) is an improvement over their innerspring mattress, (2) is cooler than their TEMPUR-Pedic mattress, (3) is suitable for two people with different preferences (soft and firm), (4) had no odors, and (5) eliminated shoulder, back, and neck pain. The Gaia™ Mattress is a great all-around memory foam mattress that is as affordable as it is versatile. Using our Biogreen® memory foam and Airflow Transfer System™, it offers you a high-end solution that fits your budget needs. It is perfect for people who want the support benefits that only true body-contouring memory foam can provide, but don’t want to sink too much into the mattress so that the spine remains optimally aligned.